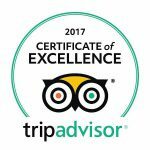 The villa is located in a quiet part of Wadi Musa. Just above the tourist street. By car it is about 5 minutes up the hill from the Visitors Center of Petra. When you are on the square of the visitors center, just look over the Mövenpick hotel and see the villa with the typical green roofs! The villa seen from the entrance of Petra and the Mövenpick hotel. The villa on the Petra map. In Wadi Musa the streets have no names. The B&B is situated in the area called Garara. This area is located above the so called ‘tourist street’. 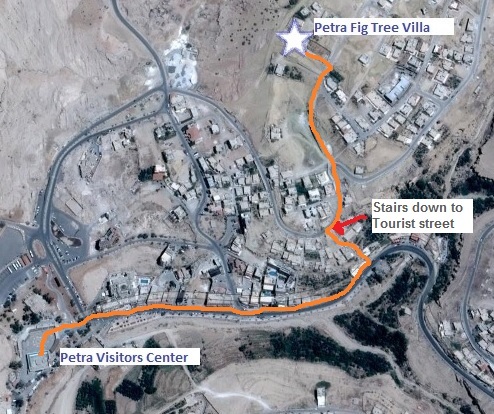 The road up the mountain to the B&B Petra Fig Tree Villa is pointed out in yellow on the map below. If you come by car from Wadi Musa you can follow the blue line to get to the point where you need to climb up the hill to the B&B. 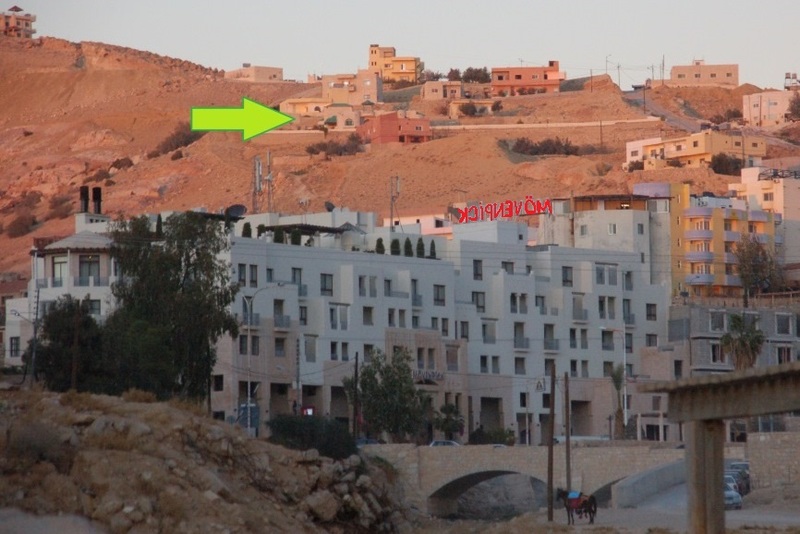 If you come from Little Petra you can follow the green line. And if you are on the parking close to the Petra Visitors Centre you can follow the red line to get to this point. Or you can use GPS coordinates 30.329359, 35.472518. This is the link to the B&B on Google maps. I can send you my location if we are connected on Whatsapp. Just let me know if you want this. 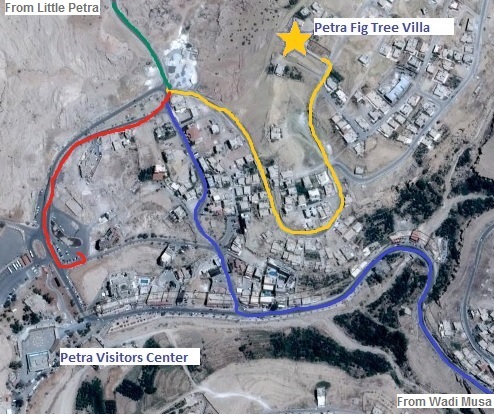 If you come by taxi ask the driver to go to Garara, B&B Petra Fig Tree Villa, the house with the green roofs. You can also ask him to call me at 00962 77 909 2675 and I will point him out how to get here. From the B&B you walk, down hill, in about ten minutes to the Visitor’s centre of Petra. On this map you can see how to get there. And off course you can also take this way back up after your Petra visit. But this is up the mountain so this will take a bit longer. Walk from B&B Petra Fig Tree Villa to Petra’s Visitors Centre.